Strong message of reassurance from FCO Minister, Sir Alan Duncan, at the annual Falkland Islands Government (FIG) reception, this year commemorating the 35th anniversary of the liberation of the Falklands in 1982. MLA Jan Cheek upbeat on the development of the Falkland Islands’ economy, despite uncertainties over Brexit and the Argentine Government’s lack of progress in implementing its September 2016 commitments to lift the barriers to trade and communications with the Falkland Islands, imposed by the Kirchner regime. Falkland Islanders and friends of the Falklands gathered in Middle Temple Hall on 13 June to celebrate the 35th anniversary of the liberation of the Falkland Islands from Argentine military occupation in 1982. The usual venue – Lincoln’s Inn – was not available because of restoration work; Middle Temple was an impressively fine alternative. Jan Cheek also paid tribute to the work of Sukey Cameron, the FIG’s Representative in London and her colleagues in FIGO. Her extensive contacts in the UK Parliament and elsewhere helped to maintain the strong cross-party support for the Falkland Islanders (both the Conservative and Labour Party manifestos had repeated their commitment to the principle of self-determination for the UK Overseas Territories). Alan Huckle, Chairman of the Falkland Islands Association (FIA) and former Governor of the Falkland Islands, proposed the Loyal Toast, having read out the exchange of greetings both with HM the Queen and, on his retirement from active public duties, HRH the Duke of Edinburgh. After the reception, the band of the Parachute Regiment beat retreat with the salute being taken by Sukey Cameron MBE and Lt. General Sir Hew Pike KCB, DSO, MBE (who commanded 3 Para during the Falklands Conflict). 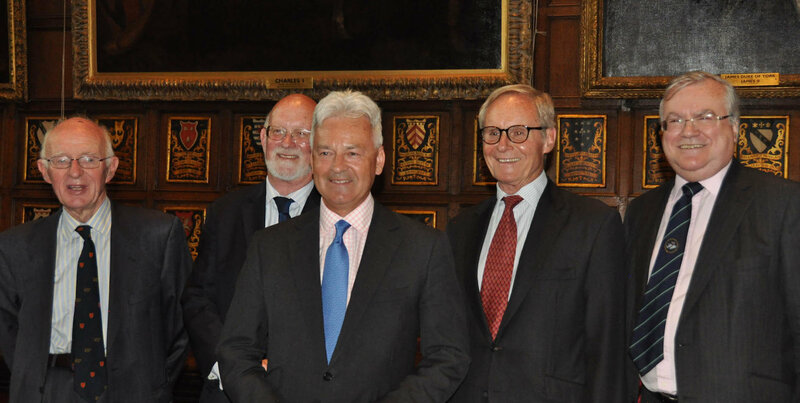 At his request, Sir Alan Duncan had a photograph taken with the four former Governors attending the reception – David Tatham (1992-95), Richard Ralph (1996-99), Donald Lamont (1999-2002) and Alan Huckle (2006-10).